Gold Souk Developer – Get updated News, Blog post, New Project review of Residential and Commercial Projects of Gold Souk Developer. If you will focus on the latest constructions of Delhi and Gurgaon then one thing will come out clearly to show you the impact of day by day rapidly increasing multiplications of properties, which is having congested architecture and messy look. Therefore, people are running towards Sohna and New Gurgaon just to get the company of nature and tranquility. You can bear the fast and noisy environment when you are outside your home but, it is obvious that we don’t want to own a house at a place where there is lot of noise and pollution ready to attack us the moment we open the windows and doors. Home is a place where we all come back after a hectic day in search of happiness and peace. Hence we cannot afford to put our money in a property where there is less satisfaction and more regrets. If you are bored of seeing different properties and still not able to find something which can win your heart then there is a dream like abode that is waiting for you in Sector-17, Sohna “Gold Souk Golf Links Apartments”. Here you can pick 2BHK, 2 BHK+Study, 3BHK+SQ and 4 BHK+SQ apartments. It is going to steal your eyes at first sight as its 4 tall towers are raising the standard of the whole area. Each tower is of 15-23 stores where every unit is separated to maintain the privacy of its inhabitants. Gold Souk Developer has over 40 years of experience in the realty sector and they have won the trust of their investors and buyers by creating several residential, official, commercial properties. So that you can say they are brilliant in constructing different kinds of projects. Here you are provided with 9 holes Golf Course which is enough in itself to explain the uniqueness of this project which is around 200 acres integrated township. It enjoys the great connectivity from Golf Course Extension Road and Sohna road. Also, it is at a close vicinity to GD Goenka Public School and KR Mangalam University. Therefore, here you can give your child better a education. It is away from the fast city life yet you can easily connect yourself from other contemporary places like hospital, hotels, markets, Sohna industrial hub, etc. You can’t perceive a perfect life in a home. There should be something else which can transform your life, and that something is modern amenities and services. Our ancestors are according to their background and surroundings, but now we want all things according to us. 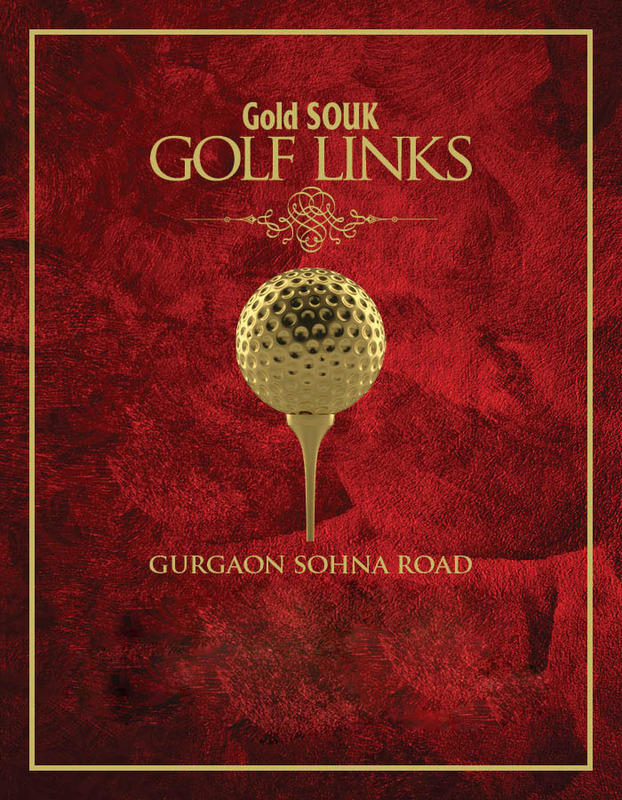 So Gold Souk Golf Link is a perfect place to have all things according to you. By the time our needs and the whole picture of a home is changed. Now it is not just a home, it’s a complete patron of dream world fully equipped with luxuries and have a perfect location that can make your life easy. This project is a perfect place for all who are seeking for that particular home, which can modify their living standards. You must be going through a busy schedule and wants to enjoy a peaceful and relax life, Gold Souk Group completely understands your this common urge and so built Gold Link with ample of motivation to give you a comfortable life. This project located in sector 17, Sohna which is a part of an integrated township that spread across 200 acres. This township is located at main Gurgaon- Sohna road, a location which is entirely accompanied by real pleasure of comfort. From Sohna road you are directly connected to the NH-8 highway, which is known as a spinal cord of Gurgaon. You are also connected to the golf course extension road, which is explicitly famous for its vast connectivity. So from you will able to reach in every direction very easy. Here you will definitely realize the true nature of real happiness. Basketball, football, cricket, badminton and many other playgrounds. The taxi stand is just few minutes away from the township, so from now you will not face any problem to reach anywhere, whether it is a distinct place or in close proximity. The Township also has luxury villas, retail shops, studio apartments, plots, commercial shops which together make a complete city picture around you. So now you can enjoy all the comfort as all your needs can be fulfilled within the township without taking any pain. The super specialty hospital is already present in the township that offers an immediate ambulance service. Schools, sports academy and very famous and exclusive golf club are also there to flourish your life with luxury. So haste yourself !!! And undoubtedly you will feel privileged by investing in this lucrative project.